It is no secret that that I believe that you can’t have a solid financial future without a key component — a budget. You can’t get out of debt without one. You can’t save without one. You just can’t really know where your money goes without one. They really are very important. Earlier this year, I shared a way to make your own budget. Mine is “old school” and spreadsheets. I’ve tried online versions, but just go back to what I know and what works for me. That does not mean it will work for everyone. Just like shoes, budgets are not one size and do not fit all! That is why it is great to find other resources. It doesn’t matter where you create your budget – just that you do it. If you are looking for an online option, you might want to look into LearnVest. They offer a free online budgeting tool – including apps for your mobile devices so you can access this information no matter where you might be. It is simple to get started. Just head over to LearnVest and enter your email address and create a password. Once logged in, you will want to click the red I’m Ready button. They will walk you through all of the information you need including your income, essentials, goals, and lifestyle. The end result will be a budget based upon the way YOU live! 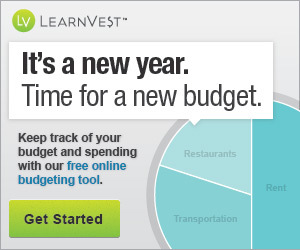 Head over to LearnVest and set up your FREE budget today!